When I visited The Hand & Flowers for the first time back in 2010, Tom Kerridge had just been on Great British Menu (series 5), winning the main course with his slow-cooked Aylesbury duck with duck fat chips and gravy. He prolonged the main course title the next year with a hog roast. 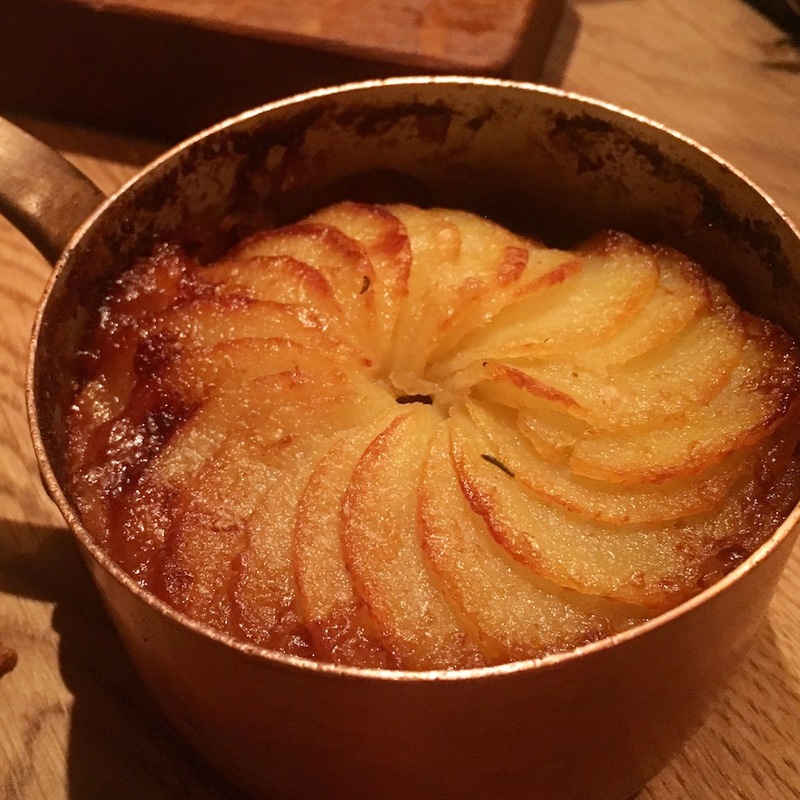 Participating in Great British Menu brought Tom Kerridge instant fame, to which Michelin contributed by awarding the Hand & Flowers a second star in 2011 (2012 guide). Kerridge has been a regular face on the BBC since, with appearances on Saturday Kitchen, but also as co-presenter of Food & Drink and Bake Off Creme de la Creme, and presenting "Tom Kerridge's Proper Pub Food" and "Tom Kerridge's Best Ever Dishes". Meanwhile in Marlow, the Hand & Flowers was (and still is) filling up months in advance, so in December 2014 he opened a second pub in Marlow called The Coach. Altogether exciting and successful years, but perhaps his most challenging and important achievement was losing a staggering 12 stone (76 kg) in weight over a period of 3 years, a huge accomplishment which has also landed him a new BBC series and book deal. The Hand & Flowers is open daily for lunch and for dinner Monday through Saturday. The restaurant offers an a la carte menu (starters £11.50-£19.50, mains £29.50-£42, desserts £13.50, cheese £14.50) and at lunchtime there's a set lunch menu (2 courses £25, 3 courses £29.50). I had dinner with my husband at The Hand & Flowers in June 2017 and we both ordered 3 courses from the a la carte menu plus one extra course to share. First to arrive were The Hand & Flowers' signature whitebait, deep-fried in a thin batter, and served with a delicious Marie Rose dipping sauce that had a nice acidity to it. 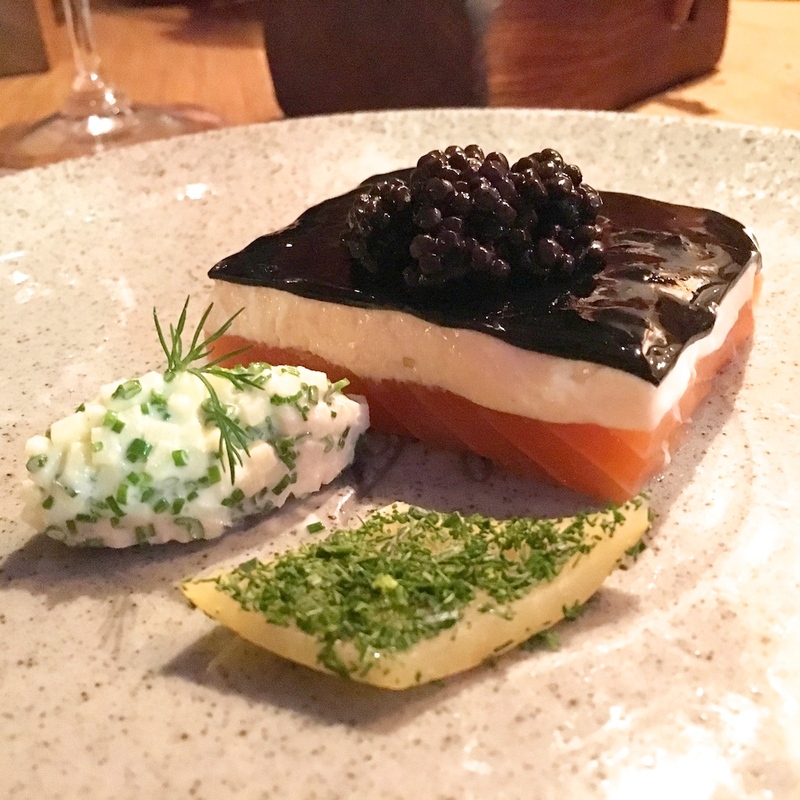 My starter was a perfectly shaped pavé of salmon covered with a layer of salmon parfait, a thin sheet of black apple jelly and garnished with a spoonful of Avruga (herring) caviar. Alongside this was a quenelle-shaped salad of fresh apple seasoned with finely chopped shallot and chives, and a piece of confit lemon. Some crisp bread and aioli was served on the side. An attractively presented dish with terrific off-raw salmon and a wonderfully smooth and creamy parfait, that had a light seasoning of dill and truffle and distinct salmon flavours. The apple jelly delivered a dramatic colour contrast but not much flavour. The apple salad on the other hand, brought a lovely freshness to the plate, balancing the richness of the salmon. Next up (to share) was a warm gala pie served with "Matson" spiced sauce. A beautiful and skillfully made pie made with crisp lard pastry, seasoned with onion and mustard seeds, and crowned by a perfect little pastry chimney. Inside was a superb filling consisting of a perfectly soft quail's egg (boiled for exactly 110 seconds), wrapped with juicy pork forcemeat and spinach leaves, neatly held together by caul fat. 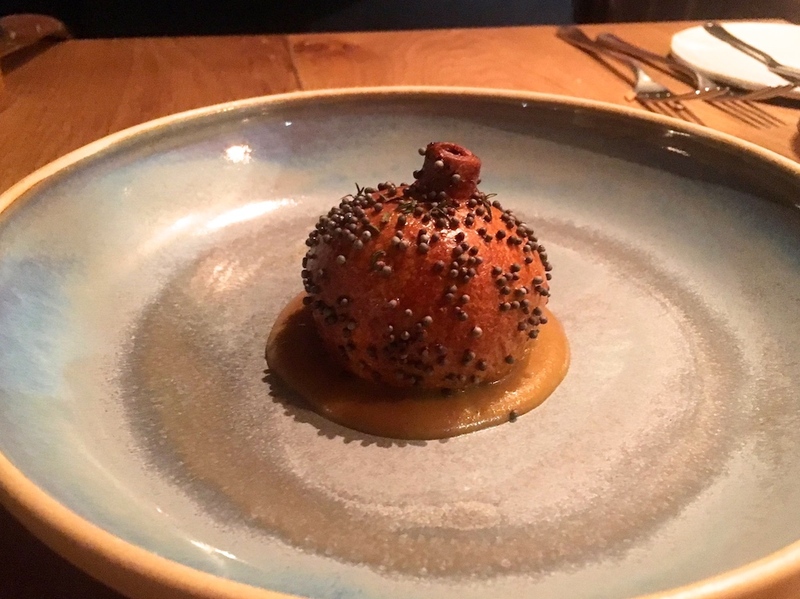 The "Matson" sauce was an elegantly sweet and spicy curry sauce, "Matson" refers to Tom Kerridge's childhood memory of chips and curry sauce in Matson, Gloucester. A thing of real beauty, I don't think a pie can get more sophisticated than this. The main course was a terrific modern take on Duck à l'Orange, the duck being a wonderfully succulent, slow-cooked duck breast and the orange was served here as a delicious bittersweet and tangy orange puree. This was complemented by a concentrated buttery duck jus, seasoned with soy and honey. 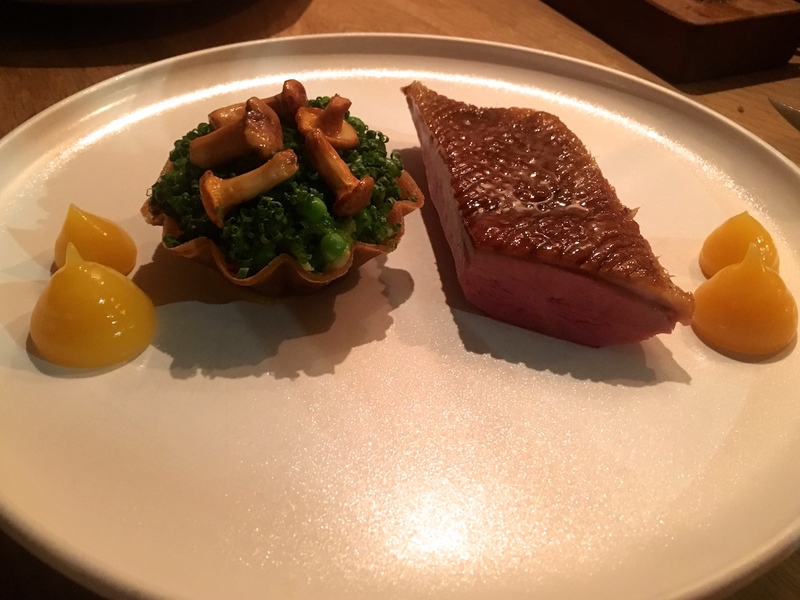 Also on the plate was a sublime tart of incredibly crisp, multi-layered brique pastry with a rich filling of duck ragout, peas, mint and girolle mushrooms. A superb dish with a wonderful, clean presentation. Duck and orange is an unbeatable combination and I liked that the orange was served as a fruity puree instead of the traditional sweet sauce. Dessert was a pleasing combination of elderflower "doughnuts" and vanilla ice cream served on some granola-like crumble with cranberries. A very seasonal dessert, only on the menu during the very short, late May-mid June, elderflower season. 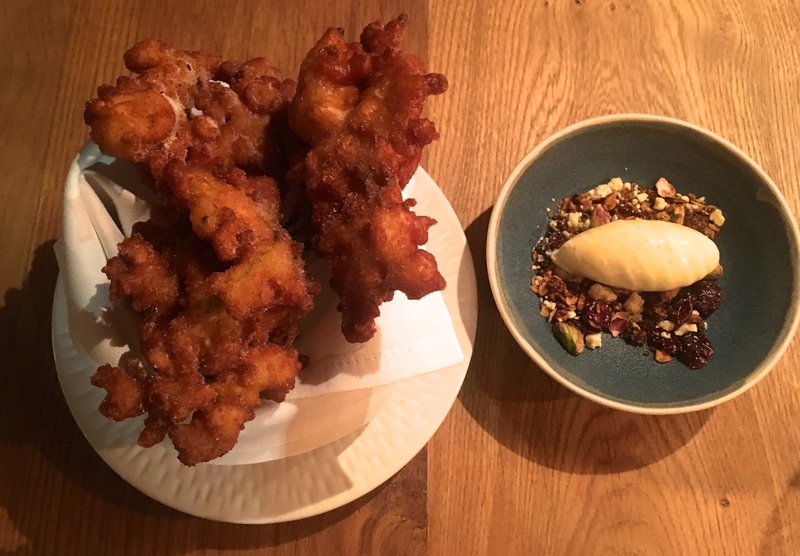 The doughnuts are essentially fresh sprigs of elderflower coated with a doughnut batter flavoured with elderflower cordial, the latter making the elderflower flavours more distinct. It's no secret that my last meal at the Hand & Flowers in December 2011 was an underwhelming experience. But that was 6 years ago, restaurants change, and no review is written in stone. The Hand & Flowers has changed. The front room of the restaurant (I'm not sure if it can still be passed off as a pub) has been changed into a bar where you can enjoy a glass of champagne or a cocktail before your meal. The back room is now the main dining area. The menu still features a few pubby dishes like pork and mushroom terrine, or steak and chips, but this time I picked those dishes which I expected to give me an insight of the kitchen's skill and ingenuity (it is after all a two Michelin starred establishment) and none of the dishes disappointed. This was very accomplished cooking with dishes that are created and aimed to satisfy, without losing sight of flavour and finesse. Genuine but sophisticated food served by friendly and knowledgable staff. Need I say more?